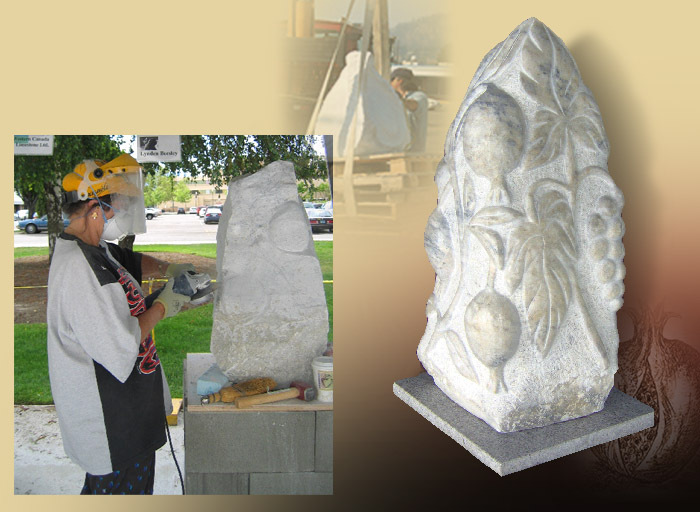 I work in different kinds of stone creating both large and small pieces. For the smaller sculptures I like to use softer stone such as alabaster and soapstone. These pieces can be worked on by hand without power equipment. The larger pieces are created in marble. During the summer of 2003 I was a commissioned sculptor for the Sculpture on Main Symposium in Westbank sculpting the Sleeper Awakens. The summer of 2005 I sculpted in marble with the Kelowna Sculptors Network for their Centennial Project “Connecting Links” Fruitopia was chosen as one of the favorites. “The Sleeper Awakens” may be found at The Cove sculpture garden in Westbank and “Fruitopia” at the Kelowna Hospice on Ethel Street in the private residents garden.